Introdruce your kids to the joys of off-roading with a Phoenix 200 Automatic PVT transmission with forward, neutral and reverse Proven and reliable, air-cooled 200 engine For riders 14 and older, with adult supervision for riders under 16 Standard Features Automatic PVT Transmission with Forward, Neutral and Reverse Easily shift between forward and reverse with the easy to use and reliable Polaris Automatic PVT Transmission. Long Travel Rear Suspension Bumps in the yard and on the trail are soaked up by 7 inches of suspension travel up front and 6.5 inches of travel in the back. 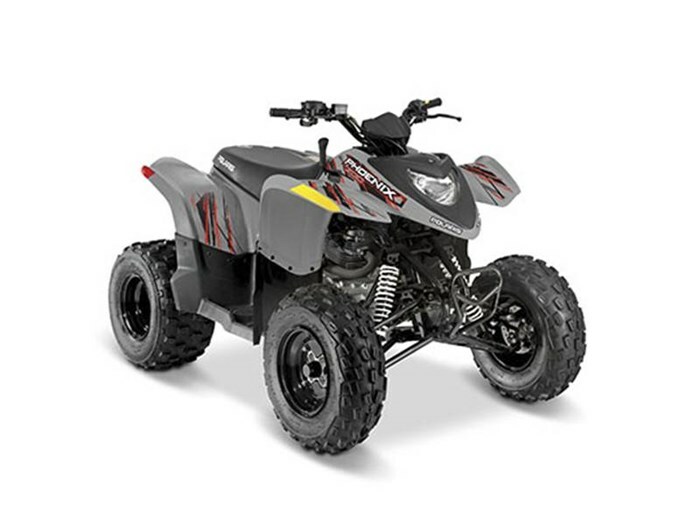 Dual A-Arm Front Suspension Dual A-arm front suspension delivers a smooth and responsive ride over a variety of rough terrain.